Coir is a 100% natural and renewable resource. It helps develop more elaborate and stronger root systems as well as reduces root diseases. It expands 5 to 7 times in volume. Save when you purchase a case of 40 - 650g bricks! • Holds between 8 & 10 times its volume in water. 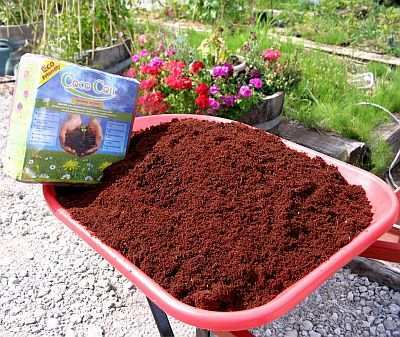 5kg Coir Brick (shown above in wheel barrow). 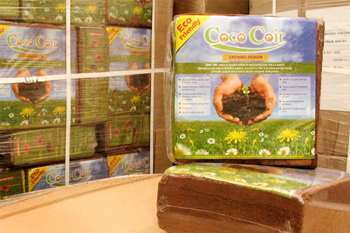 A 40/Case quantity of 650g Coir Bricks is equal to 5.2 5kg bricks of coir. Coir can expand 5 to 7 times in volume. Make sure you have a large enough container when soaking your coir. Our Coir can be purchased in single 5kg blocks (12 lb shipping wt.) or in bulk 650g (40/Case; 62 lb shipping wt.) 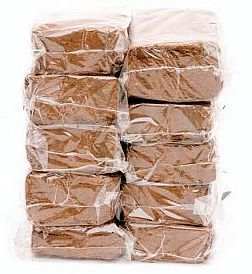 or 250g bricks (90/Case; 60 lb shipping wt.). Each 5kg coir block yields approximately 2.5 cubic ft., enough coir to make 16-19 gallons of potting medium. Each bulk 650g brick (40/Case) yields approximately 13 total cubic ft. or .325 cubic ft. per 650g brick. Each bulk 250g brick (90/Case) yields approximately 11.25 total cubic ft. or .125 cubic ft per 250g brick.